British niche line Miller Harris has launched La Fumée Ottoman, the second in a series of limited edition fragrances based on 2011′s La Fumée. The first was La Fumée Arabie. La Fumée Ottoman is a limited edition fragrance inspired by the iconic scent La Fumée. Rich and oriental, it centres on the ancient mystery of the Ottoman Empire. Incense and precious Turkish rose encircle dry and sensual woods in a dramatic arrangement of rose, spice and smoke. 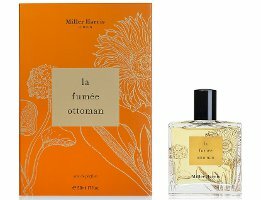 Miller Harris La Fumée Ottoman is £110 for 50 ml Eau de Parfum, and can be found now at Harrods. Haven’t tried anything from this line. I do like some, others I don’t. La Fumee was nice. I thought that was hysterical…an iconic fragrance from 2 years ago. Glad my tone came across with my question! “Iconic” is overused nearly as badly as “literally,” IMO. Two whole years to become iconic? Well, at least they didn’t call it “classic”. Hm, so iconic it is appearing in the summer sales……Now I feel mean pointing that out because I like a few Miller Harris scents (just invested in a small bottle of Fleurs de Sel) and I received some tokens last year for my birthday which I put towards La Fumee Arabie which I thoroughly enjoyed wearing during the winter. It will be interesting to smell how different this one is to its stablemates.